Keeping your apps rendering properly on all the possible combinations of browsers and Oses is a difficult and time consuming task - especially if you are still doing your cross browser testing manually. And, supporting all the browsers and Oses you need to test against on your in-house grid is a time consuming task. Automate the process of testing your apps across multiple browsers with Sauce Labs. Sauce Labs offers over 900 browser versions on our robust CI-ready testing platform including - FireFox, Safari, Internet Explorer, and Chrome. And, we support browsers across Mac OS X, Linux, Windows, Android and iOS. With Sauce Labs you can automate your testing so you can spend more time coding and less time running tests. Run Selenium tests on our cloud securely with Sauce connect, our TLS tunnel, you can run your scripts and test against data behind your firewall. 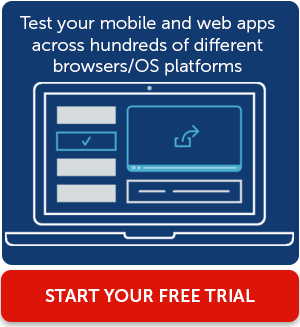 Test your site for cross browser compatibility over various browsers and OS platforms. Sign up for a free trial today.